Welcome to Matt's online journal. "This is a place I wanted to create to express my thoughts, talk through my projects, and share my photography adventures. " January was a fantastic month for my astrophotography. 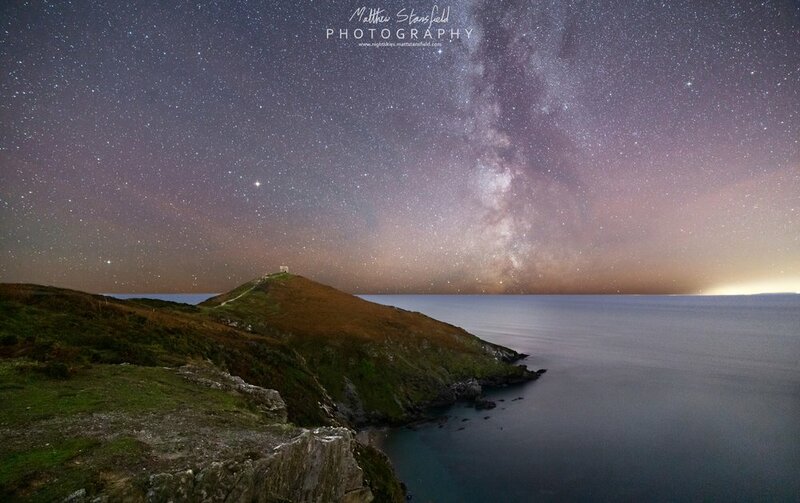 I embarked on seven incredible shoots around the Cornwall and Devon coastline as well as spending an evenings up on Dartmoor. I can’t remember a month that was so positive for clear skies and favourable conditions. Another highlight for me was meeting an incredible photographer and human, Esme, and being able to share some of these shoots with her. This photograph was, in fact, my last composition of the night where I was interested in adding a human element to the scene with some dramatic light. You can see the constellation of Orion just clipping the treetops, with a threatening bank of cloudly stubbornly holding out to the west, reflecting the glow from nearby towns. My second shoot from January involved meeting up with photographer Esme, for the first time, and wandering to Hartland Point Lighthouse on the north Devonshire coast. The Quadrantids meteor shower was peaking on this night, so we intended to photograph some of these with the Lighthouse as an interesting foreground. Once we arrived and begun walking the windy coastal path in search of an elevated viewpoint, I remember being mildly concerned with the cloud cover, but there were gaps, and the meteors were flashing by through the openings dramatically. It was also bitingly cold, so we worked quickly and kept our spirits warm through conversation while capturing some striking images. The first of many memorable night adventures we would embark on in the coming months. The following night, Esme and I met up again in our pursuit for clear skies and exciting locations. This time we decided to photograph Great Staple Tor. A dramatic place I know well, but which I have never shot under the winter sky previously. Cloud initially concerned me again while we journeyed up, but as is often the case with the Moor's elevation, clear skies can prevail wherein lower locations, it may linger. Spectacular clear skies greeted us when we did arrive, and I recall the winter circle glistening beautifully about the main stack. We worked a few different compositions, star gazed and exchanged chat — a perfect night. About a week later, I spent a dreamy ice cold night at Crackington Haven. 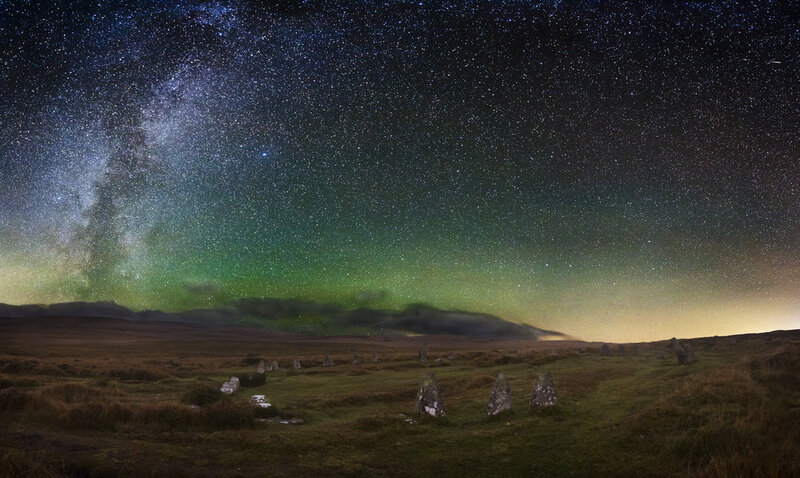 The clearest darkest skies I've experienced for some time in Cornwall. There was a lot in the sky this night for us to enjoy including the Andromeda Galaxy, the star cluster Pleiades, and of course the winter sky superbly glistening above the rugged coastline. My fifth shoot in January was extraordinary. Early Monday morning, Esme and I journeyed to the north Cornwall coast to photograph and experience the much anticipated lunar eclipse. I previously photographed a close-up sequence of a lunar eclipse a few years ago, so wanted to capture a wide angles nightscape with the moon as an element to the overall composition rather than the main focal point. Typically, the timing of totality was very early in the morning, and on a working weekday, with a high-risk of cloud interfering, it all sounded a perfect combination of circumstances to warrant a trip! A few hours kip after arrival on location certainly helped and we were alive for an exciting event. We chose to visit Rumps Point, as it was an impressive location with dramatic rugged cliffs and importantly dark skies. It is interesting, because sometimes as a photographer, my impression of an image is influenced by my experience at the time of taking a photograph. I am not sure if this is particularly good from a composition standpoint, but for me, this photographs represents the excellent company, steep moonlit trails, incredibly crisp dark skies, and a powerful sense of peace and tranquillity. What an enjoyable start to 2019 chasing dark skies! About a week later, we ventured to a local beach called Portwrinkle on the southeast corner of Cornwall. I enjoy photographing placing close to home; it's nice to be able to shoot and not need to journey hours to reach home. This particular night wasn't perfect; it was hazy with high-level cloud but a few hours well spent. 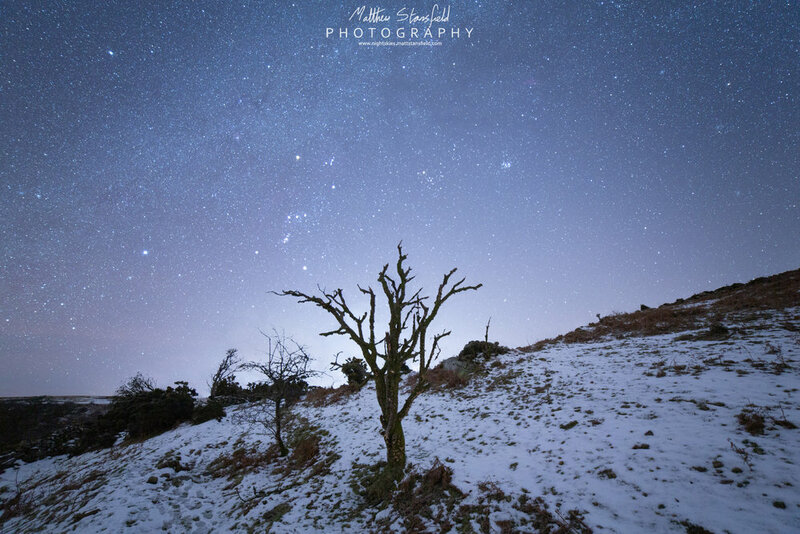 My final shoot of January, saw me take a solo trip to snowy Dartmoor to photograph the few locations around Sharp Tor and the Dart River. The night began with a dash from work, full of motivation to have an adventure, or just get lost somewhere within the expense of Dartmoor. I find a strange comfort in the coldness of the moors in the wintertime, so this was my obvious choice. The plan was to trek a 5km circle around Mel Tor, Luckey Tor, and up to Sharp to explore a few places I have previously scouted. 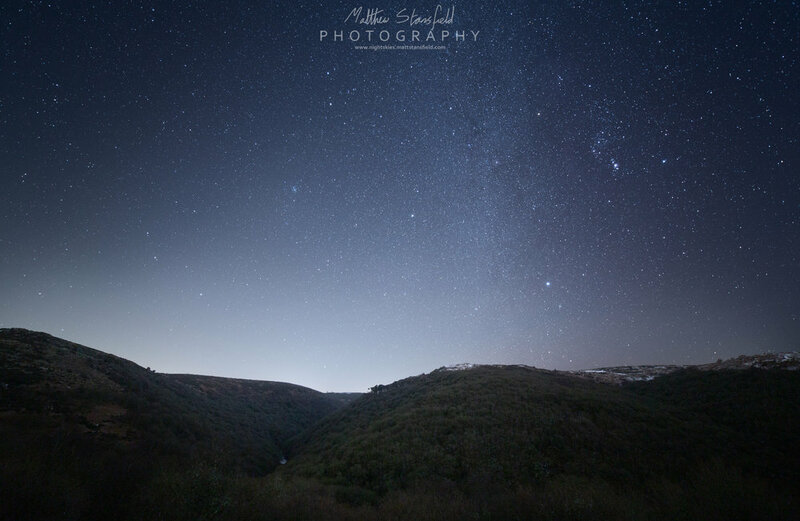 The night was beautiful, the crunchy snow crackled beneath my feet, you could hear owl calls echoing in the dark, and the hum of the mighty River Dart below the peacing stars glistening blissfully above. For the first time in a while, I actually felt haunted wandering around, been a while since I have ventured out somewhere this isolated solo, but it was refreshing too. Snowy path looking towards Sharp Tor. I have decided to embark on a mini project photographing beaches, headland, cliffs and coastal features around south east Cornwall. Work commitments have depleted most of my free time and reduced opportunities, to venture far afield, to chase darks skies. However, I have relished the opportunity to photograph closer to home and re-visit some locations, as well as finding some new places to photograph. My first trip for this project was to Rame Head. A popular local headland landmark standing dominantly at the east end of the sandy bay of Whitsand. A place I have visited before, but not with the tracker. On this night, the window of dark skies was short between the last light for sunset and moonrise. The Milky was in the southwest sky, so I had two compositions in mind. 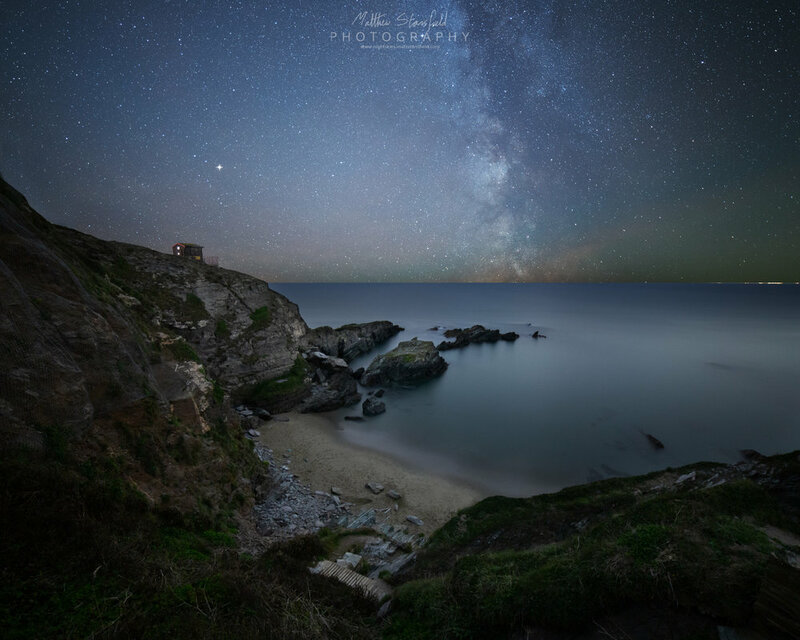 The first was capturing the small chapel on top of the windswept headland with the Milky Way glistening brightly to the right. ISO 1600, F2.8, 420 Second exposure. My second composition was rushed, with 200 seconds of the exposure being after moonrise! I wanted a central composition of Rame Head, but the inclusion of the ocean on either side. I don’t think this will be a portfolio piece but a nice addition to the project. A few days later, I decided to journey to neighbouring Whitsand Bay. A long stretch of beach at low tide, which forms many small interesting covers at high tide. What caught my eye with this composition, was the elevated perspective looking down towards Sharrow Point. This night was my favourite of the two shoots. The star sparkled vividly with a calm vibe deserting all around, as night took hold. 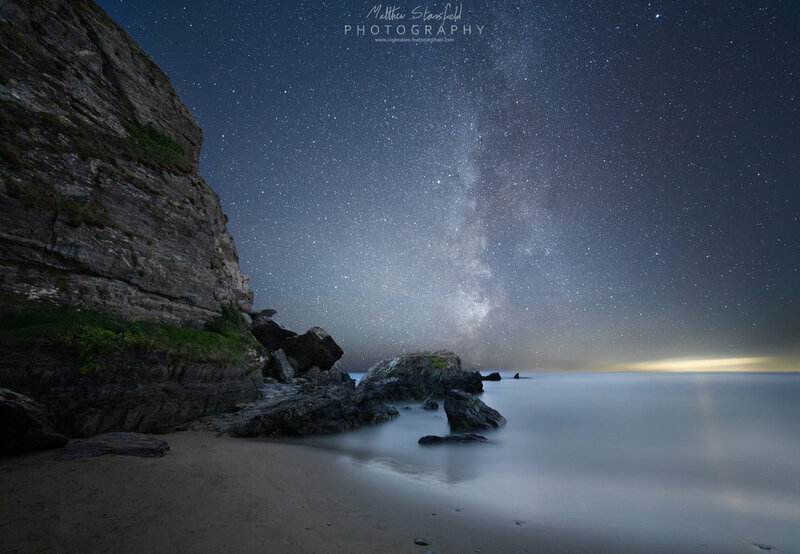 For my final image of the night and most recent photo to date, I climbed down to the beach to attain a waters edge composition of Sharrow Point leading out to the Milky Way. My next location is LongStone beach, for when the nights get clear again, is Longstone beach. I like to visit Durdle Door at least once a year. Being a 200 miles round trip, from my base in Saltash, it’s not a location I can regular visit. The conditions where set for a typically astro adventure; with only a 2 hour window between moonset and astronomical twiligh; uncertain weather, and four hours of driving to looked forward to! This was also going to be the first real test for my new Star Tracker and Samyang 14mm lens. Normally, you would navigate your way through the campsite to reach the beach or coastal path. However, they have created a bypass around the campsite through a dark woodland, which was convenient but slightly unsettling. Once through the woods, I reached the gravely windy path that snacks down to the cove. My eye was immediately drawn to the moon setting beautifully over Weymouth Bay in the distance. The reflection glistened on the glassy ocean like a flame flcikering in the wind. It was quite a sight to behold and set the scene for a amazing night under the stars. I already had my first composition in mind; a view from the top of the cliffs, looking down at the famous rocky arch. In fact, I have shot a similar composition before featuring the Milky Way. However, tonight was all about the winter constellations, which I hoped would align nicely in the sky behind the arch. Durdle Door - Sky exposure: ISO 800/F2.8/240 Seconds. Foreground exposure: ISO800/F2.8/320 Seconds. The first capture was a success! My idea with the composition was to use the natural leading lines of the cliff and bay to draw the viewer to the arch. The constellation of Orion, was higher in the sky that I anticipated, so I made a two image collage to create this slightly more squared image to include the desired stars in Orion. Durdle Door is renowned for being busy with photographers, which can sometimes create issue when so many people are light painting, but this night was peacefully quiet. Only two fisherman were on the beach with a lone photographer photographing from the cliffs. The extra clarity, in the stars, from using the tracker also impressed me immediately. it was superb to have dark skies to put it through its paces. The tracker allowed for longer exposures and a lower ISOs to be used without stars trailing. The lower ISOs also allowed more colour details to be captured, and the stars appear so much sharper. After my first starscape image, I experimented with some deep space imagery using my Canon 200mm prime. I thought this would really put my tracker to the test, as the lens is heavier and any errors in alignment would be more apparent. The first space object, I was going to focus on, was the grand Andromada Galaxy. This galaxy is a neighbour of ours in the cosmic world, and is due to collide with our own galaxy at some point in the distant future. It is also relatively big in the night sky; about the size of the full moon. However, it is extremely dim to the naked eye and a perfect subject to photograph as a way to revel that extra detail. I was amazing on quite how much detail I was able to capture with a single shot exposure! I then placed my attention to the Orion Nebular. This fantastic nebular is visible to the eye, appearing as the ‘dagger’ in the constellation of Orion the hunter. The two bright stars at the top of the frame, are called Alnitak & Alnilam and are part of Orion’s famous three star belt. I then aimed my lens at Orion’s belt, capturing an interesting nebular above Alnitak. Looking closely, underneath Alnitak, you can also make out the famous Horse Shoe Nebular. I then swung around and photographed Pleiades, a star cluster, which I always would call the “little plough”. My final capture of the night, was a wider angle exposure of the constellation of Orion. At this point, with dawn quickly approaching, I was rushing to bag this exposure. I wanted to test the quality of my 24-70mm for astrophotography, as it wasn’t a lens I’ve used outside my wedding work before. It was a tracked exposure and productive unbelievable detail in the stars captured through the area. In summary, was the shoot worth while? For me, I would say it was. It was great to capture a Durdle Door with the winter sky, which I feel, would be a good addition to my portfolio. As a learning curve, the shoot was very informative too. I feel much more confident in using the tracker with longer focal length lenses, and it was useful to see the added detail that could be captured using it. So what next? The moon has now taken over, but a new window of dark skies opens on Saturday night. I will probably try a Milky Way capture, somewhere local, before it finally disappears for the winter! Dartmoor, what an inspirational and intriguing place. 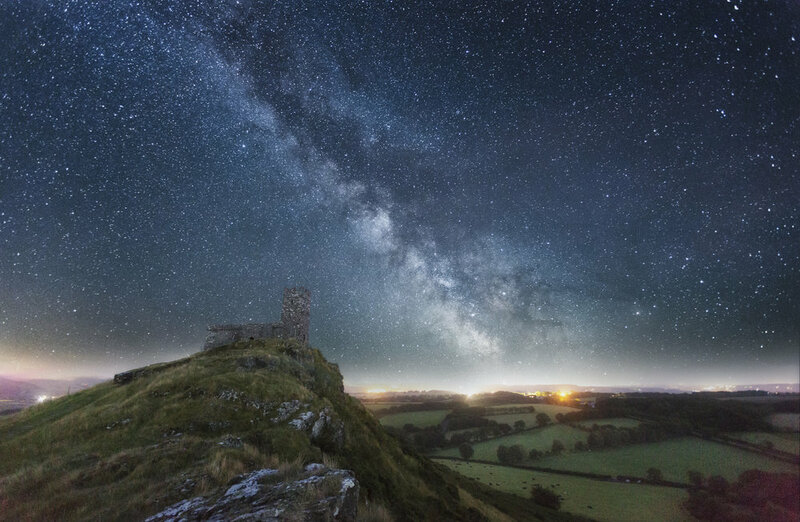 As a night location, it has spectacular dark skies and remote areas that allows for unique photography to be made. I have a number of mini projects associated with Dartmoor. One of them is photographing Dartmoor's waterfalls. Dartmoor has around fourteen well know waterfalls as described by Legendary Dartmoor. I have visited around 5-6 of these wonderful waterfalls to date with my first visit to Tavy Cleave waterfall resulting in a display from the Northern Lights! 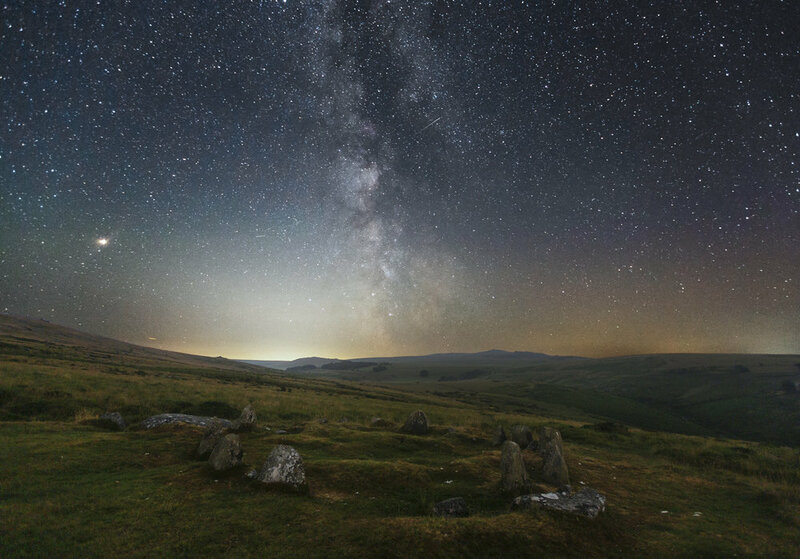 Alongside waterfalls, I have taken an interest in photographing Dartmoor's stone circles at night. There is plenty of interesting stone circles smattered around Dartmoor, and again, I have only covered around five locations so this is one my many continuing subproject. Fernworthy Stone Circle. My first photograph of one of Dartmoor's intriguing stone features. Another interest of mine, is photographing the many the dramatic granit tors. 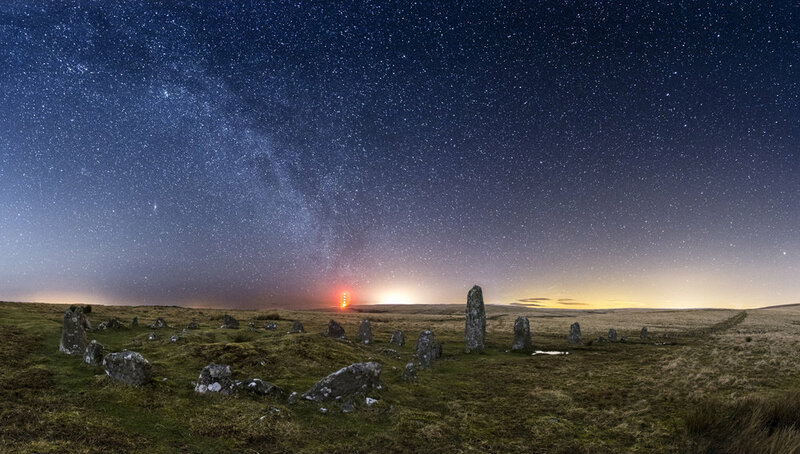 Dartmoor has around 160 tors and it could literary take a lifetime to document them all at night. So this is going to be a long term project that i'll probably never complete! My final subproject on Dartmoor has involved photographing bodies-of-water. 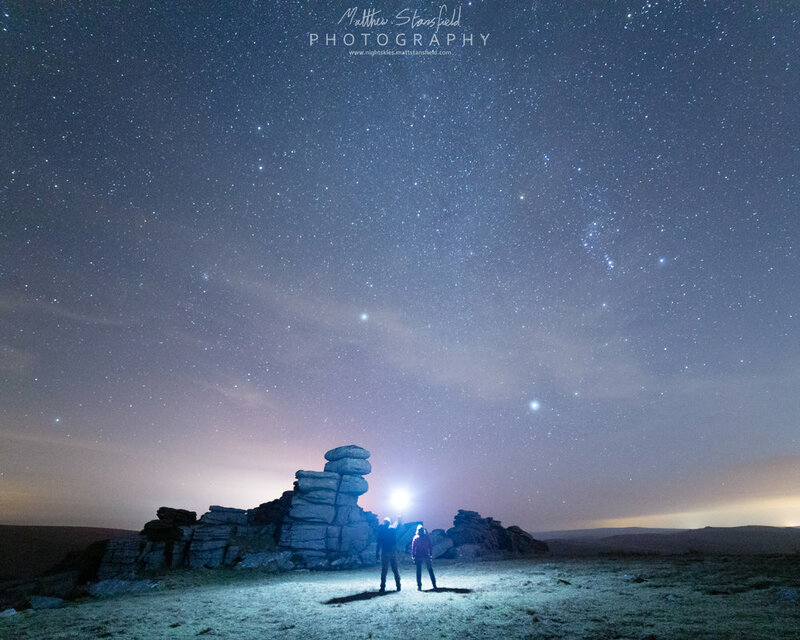 Dartmoor has many amazing reservoirs and lakes that can look incredible on a still clear night and provide a lot of interest for photography.